The story of Trustly's establishment dates back to the year 2008, when three friends in Stockholm decided to revolutionize payment systems. Ever since its day 1, this online payment method has been profitable and why not, after all, it has never failed to deliver its vision of offering fast, secure and simple online payments for everyone. Designed exclusively for European consumers, Trustly allows smooth and flawless Direct Bank e-Payments. You can rest assured when it comes to security while making online payments using Trustly. Since every transaction that you make with it is secured with the highest encryption ensuring secure transactions for all the users. 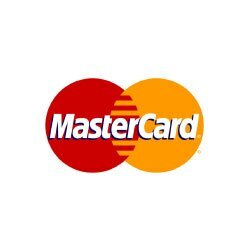 It also holds a European Payment Services Provider license in ordinance with the Payment Services Directive thus making it a reliable brand you can trust upon. Further, it provides services to all the users across Sweden and is authorized and regulated by the Swedish Financial Supervisory Authority which comes as a testimony to the high-quality services that it provides. And, the best part is that you can use this payment method even without registering an account which guarantees that none of your personal information has to be shared or is at risk. Why Should You Use Trustly? Trustly has made it really easy for the users to make deposits and withdrawals. You don't even have to register for an account or download any app to be able to use it. 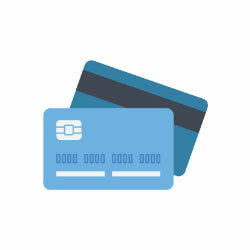 Just visit the casino that you want to make a transaction at and select this as a payment method. That's it, you will be all set to make the payment. All the users can safely make transactions within minutes with direct e-payments through their banks. Thus making it easier to play online without worrying about hassles or worries about time, speed and security. Make deposits and withdrawals instantaneously with the Payout Express which not only allows fast deposits but also lets you make fast payouts. Thus it guarantees a satisfactory user experience to the players residing in the entire Eurozone. Recently, Trustly has added one more feature to the long list of benefits that the customers can enjoy. Now they can make payments in one click which is going to make to managing subscription services and in-app purchases more convenient for you. You can now enjoy playing at some of the leading online casino's like Betsson and others without worrying about the hassles that you have to go through while making a deposit or a withdrawal. Just use this as a payment method and you will be able to deposit and withdraw the bonus funds to your bank account without the need to share your bank details again and again which is definitely going to making playing online a lot more fun! To make the things more convenient for you, these benefits come with an assurance that all the transactions that you make using Trustly are safe and secure. It is licensed by Swedish Financial Supervisory Authority and also uses high-quality SSL making it one of the payment platforms that you can trust. Customers are at the center of any reliable platform. Thus to make sure you don't have to worry about anything once you start using this platform, it provides 24*7 customer support to its users. Along with providing a safe platform to make online transactions, Trustly also brings some amazing opportunities for the players. Make a deposit using it at leading online casinos and if you are lucky enough, you may get a chance to claim some exclusive bonuses and promotional offers. Trustly has made it very easy to make online transactions as they can be carried out without the need to register for an account. Follow the below steps to make a successful transaction using this. How Can I Use Trustly to Deposit? Select Trusty as the mode of payment and choose the bank that you want to use. You will be directed to the bank site from where you can log in to your bank account. Authenticate the transaction with a one-time bank security code which will be sent to you. Once the transaction is complete, you will be redirected to the cashier. You will be also provided a confirmation email on your registered email confirming the details of the transaction. How Can I Use Trustly to Make a Withdrawal? Similarly to make a withdrawal, select Trustly as the withdrawal method from the merchant site. From here you will be taken to your bank site. Log in to your bank account using your account details. Authenticate the transaction with the one-time security token which will be sent from your bank. Once the withdrawal has been made you will be taken back to the cashier. How to Make Payments Using Trustly? Trustly lets the users make hassle-free transactions directly from their banks. Thus players need to choose the bank in which they have an account to be able to do so. However, the supported banks that you can use depend on your country of residence and can be checked on the website. Some of the wildly accepted payment methods include The Cop-operative Bank, HSBC, Forex, Banco Pastor, Banca Transilvania (BT), Ideal, Volksbank, KBC Bank and others. Just navigate to the site select your country to know which are the options available for you. How to Receive Refunds from Trustly? Similarly, you also have to choose the account into which you want to receive your refunds (if any). These options vary for the players residing in different countries. Browse through the options available for you under the 'refunds' tab. Bank Austria, KBC Bank, Yorkshire Bank, Swedbank and Alpha Bank are some these options that are available for the players residing in different parts of the world. Do I Have to Pay any Fees to use Trustly? The best thing about this payment method is that the users do not have to pay any fee to be able to use it at online casinos. All the transactions that you make are absolutely free and you do not have to pay any additional charges for that. However, you might be charged for services, domestic or international transactions which must be thoroughly checked at the Trustly site before you make a transaction. Trustly strives to enhance user experience thus it has also launched some products to add to the convenience of the players. Read below to find out more about them and keep aside all your worries while making transactions online. Visit the gaming site you want to play at. Go to the cashier and select Trustly as the payment method. The operator will receive the required information and your account will be created. Enjoy playing as much as you want. Click on the 'withdraw' option once you want to cash out your winnings. Winnings will be added to your account. Direct debit is a way to manage the recurring payments by authorizing this payment platform to debit funds from your account. But don;t worry as you have to register for a mandate for the authorization of this, thus making sure there are no unnecessary hassles or worries. It is very useful for in-app purchases, video on demand, and other financial services. Further, to maintain transparency, every day you will be sent an email regarding the upcoming transactions. Enjoy making flawless transactions with Trustly with its direct bank e-payments which is aimed to make transacting online easier for the players. To use this payment method, you just have to use your bank account normally as you do and then follow the below steps at the checkout. Choose your bank from the options available. Select the account that you want to use. The transaction will be completed. Can I Deposit in My Neteller Account Using Trustly? To add more to the convenience of the players, Trustly also lets the users make deposits to other e-wallets such as Neteller. Players from Estonia, Finland, Poland and Sweden can use this payment method to fund their accounts, to be able o do so, all that you have to do is follow the steps given below. 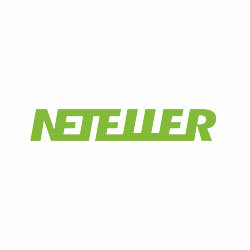 Login to your Neteller account and select Trustly as the payment method from the 'Money' section in your account. Put the amount that you want to deposit and click on 'Continue' to proceed. Once you click on continue after confirming the details, you will be redirected to the Trustly site. Choose your bank and save the Transaction Reference and details of the payment. After that, you will be taken to your online bank site from where you can complete the transaction by providing the unique reference number provided on the Trustly site. Trustly is an online payment solution designed especially for European consumers. With Trustly you can make quick and safe online deposits directly from your bank account. 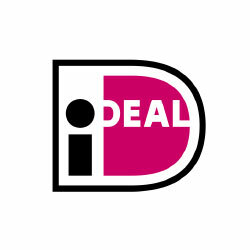 The services of this payment provider are extended to online casinos, e-commerce, travel and finance industry. How do I use Trustly at online casinos? The best thing about Trustly is that neither registration nor any software installation is required in order to get started. All you need to is, browse directly to an online casino or the merchant's site where you would like to make a deposit/purchase. Then select Trustly as the payment method and follow the on-screen prompts. In accordance with the Swedish Financial Supervisory Authority, Trustly operates within strict regulations relating to processing of payments. As a Sweden regulated payment institution, this payment gateway is subject to capital requirements and complies with applicable payment services legislation including its liability clauses. By and large, Trustly embeds the same secure encryption as that of banks and is a safe channel to make online payments. Yes, Trustly is absolutely free. You can deposit and withdraw money directly from your bank account by using this payment gateway. Apart from being free of charge, this is easy to operate as neither sign up nor any software download is required to access it. Which banks allow to deposit via Trustly? Next Day Deposit - Banca Popolare di MilaNo, CREVAL, Banca Popolare di Vicenza, Banca Mediolanum, BNL BNP Paribas, BPER, Banca delle Marche, Banco BPM, Banca Carige. What is Trustly Direct Debit? 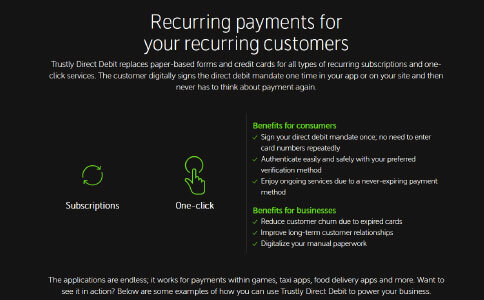 Direct Debit is the latest product of Trustly which enables smooth recurring and one-click payments. It's time to replace paper-based forms and credit cards with the digitally signed direct debit mandate with Trustly's Direct Debit and enjoy on-going services due to a never-expiring payment method. How does Trustly Direct Debit work? How do I sign up for Trustly Direct Debit? Select your bank from the available list of Trustly Banks. After selecting the online bank via which you'll make payments, enter your personal number or other information that is required to prove your identification with the selected bank. In order to authenticate yourself, use your own internet banking device or bank id and generate a digital signature. From the list of accounts that pop up on to your screen, select the bank account you intend to connect your Direct Debit with. How long does it take for the Debit Mandate to register? It usually takes one business day for the mandate to register. How will I be charged with Trustly Direct Debit? An email will be sent to you on every evening at 18:45 with details about upcoming transactions, including the reference number and amount. These transactions will be then drawn during the night and if there are no upcoming transactions then you'll not receive any mail. What is the minimum and maximum withdrawal amount for Trustly transactions? The minimum amount that can be withdrawn using Trustly is equivalent to $10 whereas the maximum amount is equal to $10,000. How long do Trustly withdrawals take? The withdrawal process usually takes everything from a few minutes to up to 2 business days; and once it has been processed, it will immediately reflect in your bank account. Contact the merchant directly to know the specific answer to this question. What is Trustly Pay n Play? 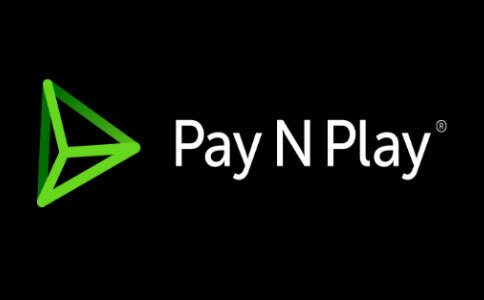 Pay n Play product is an innovative product of Trustly which allows online players to play all their favourite games in a blink of any eye, simply by making a quick deposit from their online bank. This product of Trustly has not just eased-down e-gaming by allowing quick deposits with no lengthy registration, but is has also reduced withdrawal times so that you can enjoy frictionless gaming. How does Trustly Pay n Play work for online casino players? Visit your favourite online casino and click on 'Play Now' button. Initiate a deposit at that particular gaming site by selecting your bank. Complete the deposit procedure by logging into your online bank and verifying your identity. You can now start playing all your favourite online casino games with a click. When you scoop in some good amount of real money and are all prepared to cash out your winnings then click on 'Withdraw'. Your winnings will be instantly credited to your bank account that you originally deposited from.